The theme this time at Creative Tuesdays – Time for Tea (or Coffee). So here is my interpretation of the theme. 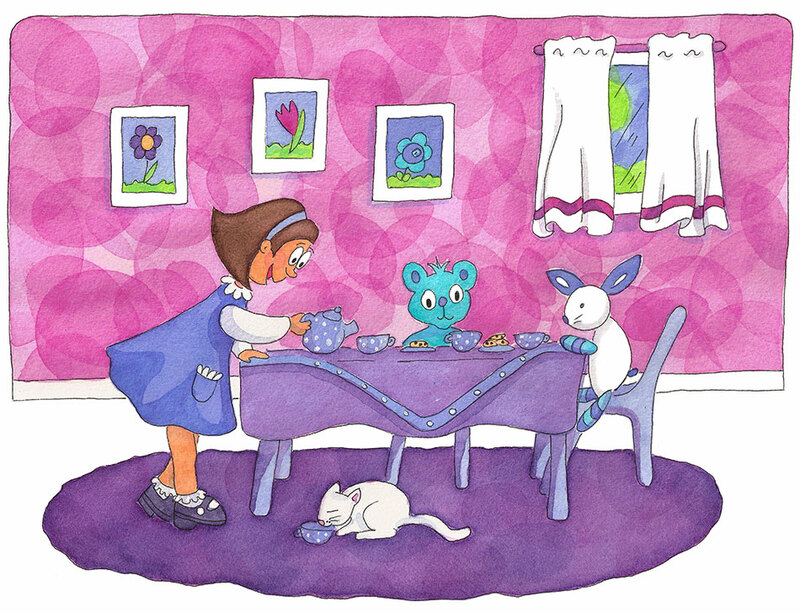 As a little girl, I had a tea set. I think it was a required that all little girls had tea sets … well, back in the dark ages when I was little!! I decided to change up my color palette a bit. I’m really into blue, so decided to go with pinks/purples this time. Now I’m going back to blue!! Not a big pink/purple fan! And my cat on the rug looks like a rat. What’s up with that? Oh, well. Enough self criticism … it’s time for another cup of tea! 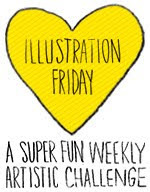 Be sure to stop by Creative Tuesdays and see other great illustrations! Thanks to Michael for hosting!! This is so cute! Yes, all little girls wanted a tea set. You know I had one, but my cousin had an even nicer one, more real looking, I was so envious. I love your little tea party. I not only had a tea set as a little girl, but have collected tea cups and pot for years and years and have hutches full and hat boxes full. I do love tea and tea things. I don't think the cat looks like a rat at all...we had a white cat for years named Mananna. I love the pink and purple! Oh heck, I love all of it, and I do not think the cat looks like a rat. Yay a tea party! They are my favorite activities ever, whether with stuffed toys or actual pets. This is truly adorable, the colors are wonderful and the stuffed blue bear is my favorite, what a precious face. They're all great. Happy C.T.! Heh, well I love your take. It is very darling. The purple doesn;t bother me and neither does the cat which looks totally like one to me too. Haha. I love your scene and especially the polka dots and the wonderfully striped toy rabbit on the end. Well done, Sus. Great take. this is adorable. I like the cute stuff dolls and the polka dot tea set. I also had a habit of using blues a lot but whenever I try to veer away from it, I would always end up using more blue! but it is good to try other colors. very cute take on the theme. have a lovely day.